Fitness smartwatches: Worth the money or just expensive eye candy? It was only a few years ago that people wore bracelets and watches on their wrist. 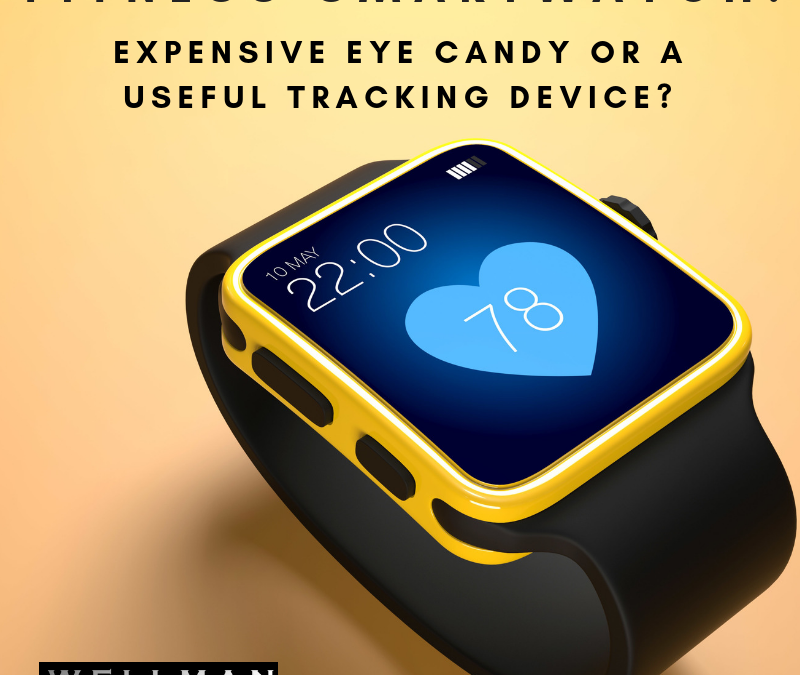 Modern day technology means we can get a lot more information from our wrist devices than just a bit of eye candy or telling the time. Starting from step count and heart rate all the way to exertion level and recovery, wrist worn fitness smartwatches are telling us more about ourselves than we ever. There are many different fitness smartwatches available that provide various bits of data about your physiology, including heart rate, steps, calories expended, activity and sleep. This wealth of information is useless if you are not able to use it in the right way and take action. The first useful bit of information would of those would be the step count. This has become increasingly more important to the general public given the research linking activity level and the onset of certain diseases. Studies have suggested that 10,000 steps per day should be the target for chronic disease prevention . Other studies have suggested a more modest step count such as 6500-8500 steps/day for preventing cardiovascular disease. Tracking how many calories you have expended during the day count is another feature of fitness smartwatches. Your basal metabolic rate is most likely calculated by using a common BMR equation which factors in your age, weight, height, and gender. Total Daily energy expenditure (TDEE) is calculated based on the amount of activity you accumulated throughout the day along with the intensity of that activity. Knowing how many calories you burn helps you balance your caloric intake and manipulate your bodyweight as you see fit. The majority of fitness smartwatches can also track quantity/quality of your sleep. With all this wealth of information, it is only valuable if you know how to use the information to help you reach your health and fitness goals. The research shows that step count and activity reminders featured in the fitness smartwatches have a significant impact on exercise adherence and motivation. When you can see how much you have moved throughout a given day, it keeps you accountable and there is no more guesswork. You might think you are being more active than you really are, the step count works well for identifying how many steps you have really done and help you to stay active. It’s easy to get lulled into thinking you are being more active than you are because you went to the gym for 60 minutes, but what about the other 23 hours in the day? Ideally you should strive to being active throughout the day. Many trackers will remind you to get up and move around every hour. This can help you create better habits, or give you a reality check. Calorie count is something everyone wants to know with respect to their own expenditure. However, the calorie count from your watch may not be accurate due to the indirect nature of measurement. Since it is only using estimates for BMR and activity level, true calorie expenditure could be very different from the one displayed on your smartwatch. Even though it may not be accurate, it will still be consistent over time and give you a rough estimate of where you are at. You can use the calorie count to let you know whether you’ve been putting in more or less effort based on what it usually reads for calorie output. This could be especially useful in a dieting situation when effort and non-exercise activity thermogenesis (TDEE) like step count tends to decrease. Most of the new fitness smartwatches on the market measure sleep quality/quantity. You may think that you sleep 7-9 hours, but data tracked from your smartwatch says otherwise. Getting 7-9 hours of sleep is one thing, but making sure they are quality hours is another. Gaining information like this is invaluable, only if you take action and make positive changes to your life. Look out over the next couple of weeks for my 3 part series on sleep and how to optimise sleep to improve health, well-being and performance. To conclude, If you are more serious about your fitness, then i would consider upgrading to a fitness smartwatch like a fitbit, iwatch or garmin. Everyone these days seems to be wearing a tracking device on their wrist. However, the information is useless, unless you are able to use the information to take action to make positive changes to your health and performance. If you are able to use the data to motivate and improve your performance, then they are a worthwhile investment. Whether you are new to a healthy lifestyle and looking for motivation to move more, or a fitness enthusiast who wants an in depth analysis of their physiology, there is a tracker out there for you. Once you get to grips with what the data is telling you and how to use it, you will be able to take advantage of the technology and reap the benefits.